The membership of International Longshore and Warehouse Union (ILWU) Local 10 has voted at its meeting on April 16, 2015 to call for a stopwork meeting on May 1st. It is fitting that on May Day, International Workers Day, Bay Area ports will be shut down to protest the racist police killing of mainly black and brown people. This is the first U.S. union to take such action. 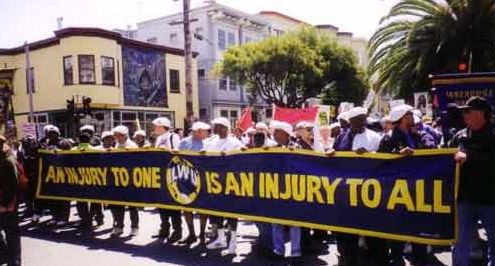 Local 10 took similar action on May Day 2008 to close Pacific Coast ports stopping all work to demand an end to the wars in Iraq and Afghanistan, the first such anti-war union action in American labor history. Every July 5, Bloody Thursday, the ILWU shuts down all West Coast ports to commemorate the killing of two strikers shot in the back by police during the 1934 maritime strike. That police murder provoked the San Francisco General Strike. Most recently the local has rallied and closed Bay Area ports to call for justice for the family of Oscar Grant, a young black man killed by BART police in 2009. Today, Local 10, outraged by the recent escalation in police brutality throughout the U.S. that has resulted in the needless killing of innocent and unarmed minorities, has called for unions and workers to join our march from the port to Oakland City Hall. For information call Local 10 Chairperson Stacey Rodgers 510-686-0634. 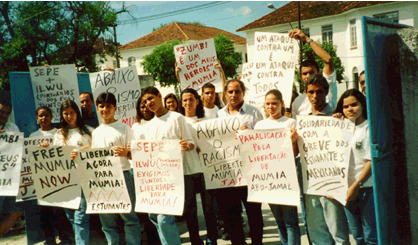 This entry was posted in Labor for Mumia, Other Campaigns, Rallies and Actions, Recent News on April 22, 2015 by admin.